Dive in to our Ibizan flow yoga holiday this summer-time. Retreat into Ibiza’s spiritual heartland with 4 of Ibiza’s finest yoga teachers and enjoy the personalized support of Ibiza Retreats´ Susie Howell and Larah Davis, with Arun Eden-Lewis and Nora Belton, combining over 70 years of yogic knowledge and experience. Learn how to develop your own yoga flow, reconnect with your inner-wisdom and deepen your practice and understanding, with plenty of time to chillax and soak up the summer vibes. Let us guide you through a refreshing exploration of the 8 limbs of real yoga – Ibiza style, and move beyond the asanas to create a truly holistic practice that enables you to open and strengthen body & mind. Remove limitations and find your rhythm and flow for life. This revitalizing and relaxing yoga holiday is set in a stunning zen-ashram retreat villa, with all home comforts so you can luxuriate in the tranquility, swim in the Balinese lap-pool, siesta in the shade of the trees. All rooms en-suite from 995 GBP sharing. Ibiza Retreats signature Ibiza Yoga Holiday offers Dynamic Morning Vinyasa Flow Yoga practices, balanced with time to chill-out at the beach, shop at the hippy markets, massage and pamper with treatments, swim in turquoise seas or siesta by the stunning lap-pool or shake a tail feather or two if the mood of the moment takes you! Embrace the Free Spirit of Ibiza and learn how to go with YOUR flow – on and off the mat. If you wish, enjoy optional evening workshops, for deepening your practice, focus on pranayama, meditation, live music kirtan with mantras under the stars, mudras & bhandas, restorative yoga and self-healing massage. Each guest receives a 1:1 yoga & holistic wellness consultation at the beginning for us to understand your needs…. so we can support you to develop confidence on – and off – the mat. Conscious yogic cuisine brunches & 4 x suppers (vegetarian, wheat & dairy free yet utterly delicious!) is balanced with some light & lively nights out to celebrate life IF you feel you want to let your hair down with your newly restored energy! Massage aches & pains away with an a la carte menu of pool-side treatments & therapies. Treat yourself to a gorgeous Ibiza-yoga-flow, be spontaneous and do what feels good on and off the mat with some of the island’s finest teachers coming together to give you a mind-opening, heart-wowing time. Enquire here now. 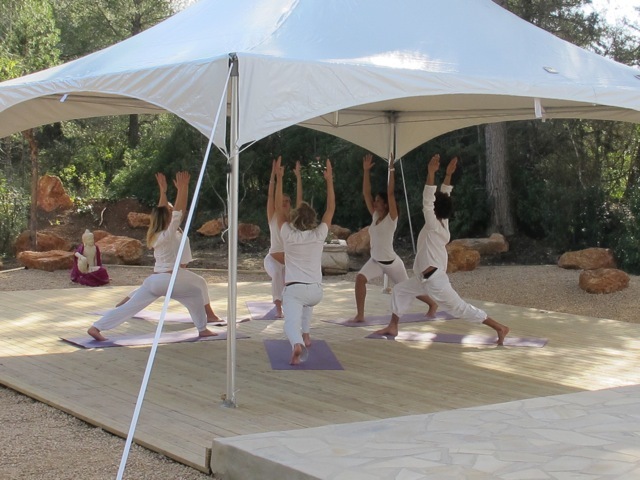 ‘Go with your flow’ Ibiza Retreats Signature Yoga retreats 24-31 August & 7 – 14 September 2013, are delicious yoga immersions in a beautiful 4* plus Yoga retreat villa with pine & rosemary scented Shala and gorgeous lap-pool in the San Lorenzo campo. Inspired by the free-spirit of Ibiza, Larah & Susie of Ibiza Retreats, supported by wonderful Ibizan guests teachers to offer you many decades of yogic expertise to add breadth and joy to your practice. From 995 gbp / 1190 euros These 6 night / 7 day retreats offer a rejuvenating yoga holiday OR the supported space to dive deep into the transformative potential of yoga.. pranayama, breath-work, kirtan, moon-lit meditations, time and space for contemplation, reflection, open-hearted company and plenty of positive vibes. Feel the Ibiza magic and dance, or even sleep under the stars. Discover your inner rhythms, learn how to go with your flow physically, emotionally and spiritually…. on AND off the mat! Led by Larah and Susie of Ibiza Retreats and bringing together some of Ibiza’s finest teachers, 3 hrs daily Hatha Vinyasa Flow yoga, Pranyama, Meditations, focusses on Mudras & Bhandas, Restorative yoga therapy, Thai yoga massage & Kirtan. Fabulous Yogic Cuisine brunches & dinners. Concierged evenings out for those that like to dance-celebration and plenty of massage & pampering therapies to relax and release. Cost: £995 sharing including: 3 hours of yoga a day, smoothies, brunches, teas and waters all day and three divine conscious dinners under the stars so that you can also explore… if you wish, the amazing cuisine around the island. For more information visit the Go with your Flow page on our website or contact us to book your place on this unique retreat. Join Larah of Ibiza Retreats for Go with your Flow Yoga @ 38degrees North wellness club @ Aguas de Ibiza Friday 21st December. Winter Solstice is the pivotal date for change and transformation at this special time in history. Share the world-wide collective intentions to raise consciousness with your practice and promote peace and healing as we move into a new age of remembering and celebrating our connections. Join us to meditate for world unity and send our intentions out there together and join a matrix of mind and heart-opening energy with millions of other people in our world unity meditation. Be part of the change you wish to see…. 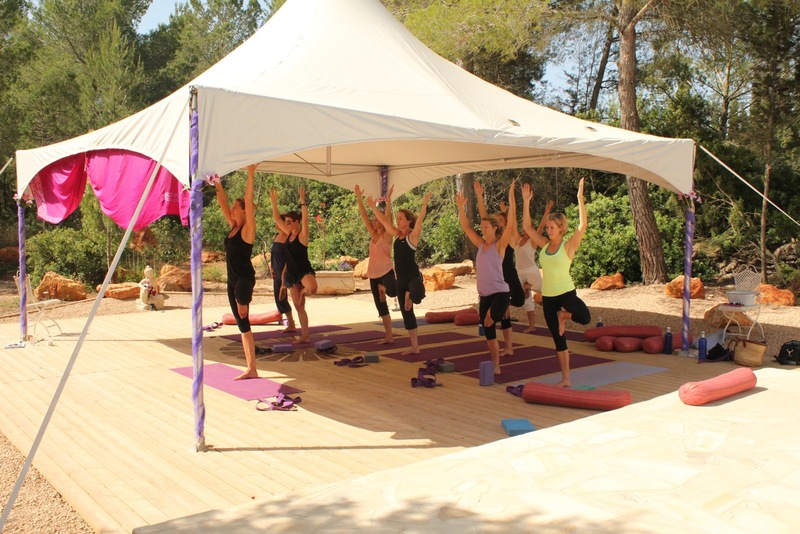 for the greater good of humanity – email larah@ibizaretreats.com to confirm your mat-space now!